Oct. 27: Let’s Talk Waterfront! 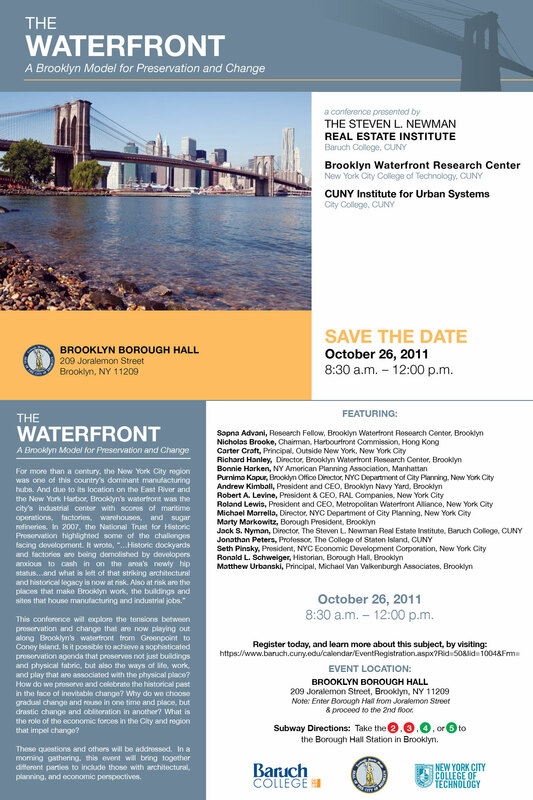 On Thursday, October 27, the BWRC will be sponsoring a “hangout session” mainly for faculty and staff at City Tech who are involved with the “Living Laboratory” grant, which involves revamping our General Education curriculum to make the Brooklyn waterfront our classroom. But we welcome and encourage anyone to stop by who wants to discuss relevant issues: economic development, gentrification, access, the effects of climate change, architecture and preservation, etc. This will be the first of several gatherings over the course of the academic year. The first meeting will be the most informal, with the main purposes of gauging interest, gathering ideas for future sessions, and socializing. Future sessions may include some low-key presentations, panel discussions, or screenings–nothing too formal. The hope is that these events will become a regular forum to discuss scholarly work, teaching and curricular concerns, as well as general issues facing our borough’s waterfront communities. Registration is open–just click the image below. The event is free, but you must register. Free and Low-Cost Boat Tours of Newtown Creek in October! The Newtown Creek Alliance and the Working Harbor Committee have teamed up to offer educators a free boat tour of Newtown Creek on Tuesday, October 18. Low-cost ($10) tours of the Creek will be offered to the public on Sunday, October 23. Visit the Newtown Creek Alliance online for RSVP information and directions. See you on the boat! Join our comrades at the Newtown Creek Alliance for a bike tour of Newtown Creek this Saturday, October 1, departing from N. 11th and Wythe at 2 p.m. They’ve provided an annotated route map. Whether or not the media overhyped Hurricane/Tropical Storm Irene (the hype was indeed justified for the once-in-a-generation flooding event in upstate New York and Vermont), the storm did bring New York City’s planning for potential flooding into the broader public consciousness, and perhaps helped to foster a new kind of awareness of Brooklyn’s intimate relationship with its watery perimeter. The map above, created by WNYC’s web guru John Keefe (you can find the original interactive, “zoomable” version here), vividly illustrates Zones A, B, and C, areas of varying threat gradation from hurricane storm surge. 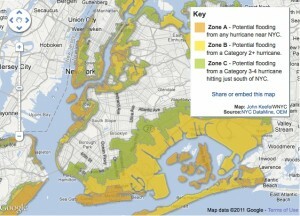 Zone A, the area most likely to flood with storm surge from a hurricane of any intensity, includes the recently developed “Gold Coast” of Greenpoint and Williamsburg, as well as all of Red Hook and Coney Island, two other “hot zones” of current and future development. (This zone was under a mandatory evacuation order; it would be interesting to know how many denizens of the new high-rises complied.) As climate scientists and meteorologists almost universally concur that we are entering a new phase of more violent weather events and rising seas, could Irene serve as an urgent reminder that future waterfront development needs to take these contingencies seriously? And might the city’s evacuation zoning have some sort of impact on the real estate market? Or will these concerns quickly evaporate as Irene’s media cycle expires? 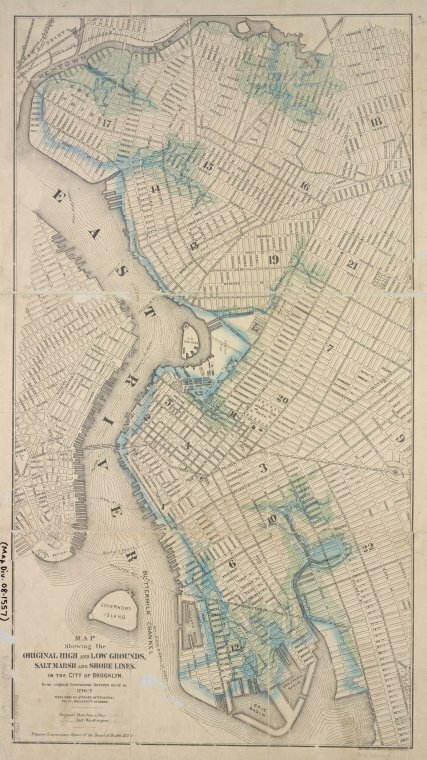 Irene prompted an even more granular analysis of storm surge effects in the NYC metro area and Long Island by Steven Romalewski, the Director of the CUNY Mapping Service, which you can find at his blog, Spatiality. His August 30 entry is password protected, but there are some other great resources here. 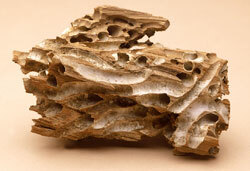 Make sure to check out this fascinating article in today’s New York Times about the cleaner water in New York Harbor enabling the return of two sea creatures–gribbles and shipworms–that snack on the wooden pilings supporting several new waterfront parks that are under construction, most notably Brooklyn Bridge Park. Mitigating the problem has added millions to construction costs. Preserve existing working waterfront, grow and encourage industries that will need, train and hire skilled and unskilled workers, balance with recreation and environment. Piece of cake! Floating pools! Any place where water meets land fascinates me, and I find the way humans have modified that intersection of elements to meet their needs especially complicated and compelling. I’m interested in restoration of screwed-up waterways, but especially in noticing the ways that nature takes back these post-industrial zones. Congratulations, Nancy! She and her guest will enjoy a Hidden Harbor boat tour of Newark Bay. The Brooklyn Waterfront Research Center is excited to be co-sponsoring a morning conference at Brooklyn’s Borough Hall on Wednesday, October 26, that will feature a wide array of speakers on the theme of preservation and change along Brooklyn’s shoreline. The BWRC is co-sponsoring the event with the Steven L. Newman Real Estate Institute at Baruch College and the CUNY Institute for Urban Systems. The Center’s two research fellows, Sapna Advani, who is director of planning at Chelsea West Architects, and Jonathan R. Peters, who is Professor of Finance at the College of Staten Island of CUNY, will present original papers based on the research that they have been conducting under the Center’s auspices. Advani’s paper will discuss the design opportunities and problems facing the borough’s waterfront in the present and near future, with a particular focus on the Sunset Park neighborhood. 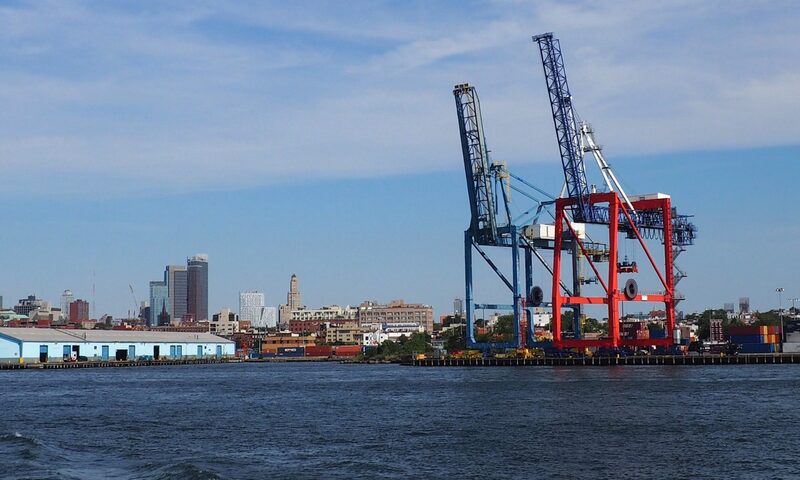 Peters’s paper will analyze the economic forces that challenge Brooklyn’s “working waterfront,” with an emphasis on the transportation issues that are crucial to the retention of waterfront industries. Both reports will be distributed in a joint Newman Institute/BWRC publication featuring photographs by City Tech Professor Robin Michals. Other speakers include Nicholas Brooke, the chairman of Hong Kong’s Habourfront Commission; Richard Hanley, Director of the BWRC; Bonnie Harken, the co-chair of the American Planning Association’s Waterfront Committee; Roland Lewis, the president and CEO of the Metropolitan Waterfront Alliance; Brooklyn Borough President Marty Markowitz; Jack S. Nyman, director of the Newman Real Estate Institute at Baruch College; and Seth W. Pinsky, president of the New York City Economic Development Corporation. For more information, see the Newman Institute’s page for the event here. Register for a seat at this free event here. 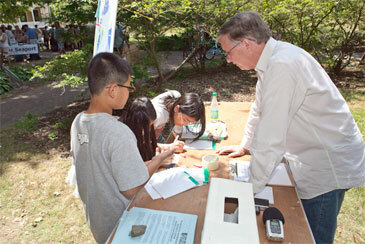 The BWRC celebrated City of Water Day – were you there? 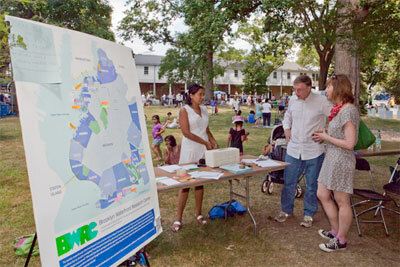 The Brooklyn Waterfront Research Center joined hundreds of other organizations and thousands of other supporters, fans and enthusiasts of NYC’s waterways on Governors Island this past Saturday for City of Water Day. We spent the day gathering fascinating stories and valuable input from dozens of people about their thoughts, hopes, opinions, and best anecdotes about Brooklyn’s waterfront. Thanks to everyone who stopped by our table to share your thoughts on the Brooklyn waterfront. The winner of our contest for the best suggestion on the waterfront will be announced later this week. Have a suggestion, an opinion, a thought or an anecdote to share, or a favorite waterfront spot to reveal? Let us know in the comments! See you at City of Water Day! We at the Brooklyn Waterfront Research Center are excited to participate in City of Water Day on Saturday, July 16 on Governors Island. Take the free ferry from Brooklyn Bridge Park or lower Manhattan to Governors Island and stop by our table and share your thoughts on your favorite places on the Brooklyn waterfront!